In the last few years, several red states including Oklahoma and Arkansas have passed laws requiring that privately-funded memorials of the Ten Commandments be allowed to be displayed at or near government buildings. Michael Tate Reed II of Van Buren, AR is having none of that. In 2012, after much debate, Oklahoma placed a statue of the Ten Commandments at its state capitol building. The state justified allowing the statue because it was privately funded, even though Article 2, Section 5 of the Oklahoma Constitution says public property should not be used for anything to do with a particular religion. In 2014, Michael Tate Reed II rammed his truck into that statue, destroying it. The statue was replaced, but then in 2015 the Oklahoma Supreme Court ruled that it must be removed. His psychotic breaks led to getting inspiration from a Dracula movie, thinking Michael Jackson’s spirit was in meat, believing he was the incarnation of an occult leader and attempting to contact Lucifer’s high priestess he called Gwyneth Paltrow. At some point after that, Reed apparently moved to Arkansas, another state with a controversial state capitol Ten Commandments monument debate. The placement of the monument under this section shall not be construed to mean that the State of Arkansas favors any particular religion or denomination over others. Many people felt that this loophole did little to mitigate the several pages talking about religion directly preceding it, but the bill passed anyway. A competing statue of Baphomet, a goat-headed, angel-winged creature accompanied by two children smiling at it. Efforts to install that display, however, were blocked by a law enacted this year requiring legislative approval before the commission could consider a monument proposal. The Satanic Temple has vowed a lawsuit over the measure, and said it didn’t believe the law should be applied retroactively to its proposal. I am a TERRORIST Who shall destroy many with the Fire of The Holy One of Isreal Yashua the Christ who alone is God YA Peace to Isreal forever for her King shall come and she shall be saved. And you oh fierce King of understand dark sentences shall be destroyed without hands yes you Donald Trump #CHECKMATE I’m not against service men and women I Thank them all for what they do. I’m against this whore nation that now lives in abominations before God. Yesterday, June 27, the 6,000 pound granite Ten Commandments monument was finally installed at the Arkansas state capitol building. Also yesterday, the ACLU announced it was planning to file a federal lawsuit challenging the monument as an unconstitutional government endorsement of religion. 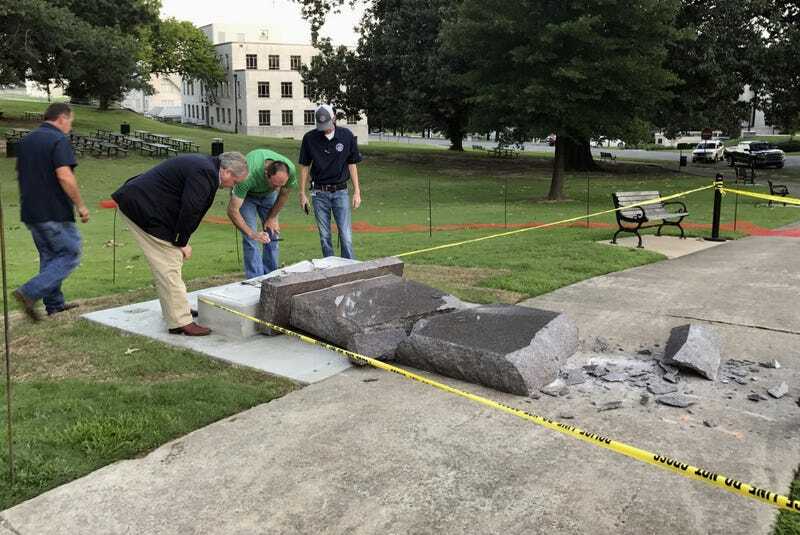 Last night, Michael Tate Reed II drove a Dodge Dart into the brand new Arkansas Ten Commandments monument, destroying it. Conveniently for law enforcement, he streamed the event on Facebook Live. This morning he was booked in the Pulaski County jail on preliminary charges of defacing objects of public interest, criminal trespass and first-degree criminal mischief. Be warned, red state governments: if you put a religious statue at your state capitol building, Michael Tate Reed II is going to drive something into it.